The game of poker is very intense these days. Players are younger, more aggressive and with tons of experience playing in many live tournaments, whether it's the WPT, EPT or WSOP and have years of experience playing hours each day in online poker rooms such as PokerStars, 888 Poker and other leading poker rooms. Nevertheless, no matter how many years of experience you have around the poker tables, no matter how much money made in tournaments or live events and no matter if you're an amateur player or a pro, every poker player has the same nightmare and it's being eliminated from a tournament because of a bad beat, and that is while holding a monster hand! The hand you're about to see in this video happened during the $1 million buy-in 2014 WSOP Big One for One Drop tournament and yes, you've read it correctly, this is no mistake. To enter this tournament every player had to pay $1 million just to be eligible to play this special tournament where the winner takes home no less than $15,306,688. Needless to say, the person you'll see in this video did cash this astounding amount in the bank; he was eliminated in what was described as "the worst bad beat in history of tournament poker" by ESPN commentator Lon McEachern. The two players (Cary Katz & Connor Drinan) picked up pocket aces and started calculating in their heads how to play the hand for maximum profit, I mean this is the pre-flop dream and the best hand you can get before the flop. After some raises from both sides and a bit of Hollywood acting, both players went all-in and were disappointed to see that both held "bullets", the same hand of pocket aces…so now it's time to open the cards on the board and chop/split the pot, right? Wrong! This is how you can unfortunately lose with pocket aces to pocket aces, just too bad it had to happen when you pay $1 million of your own money just to play this tournament. 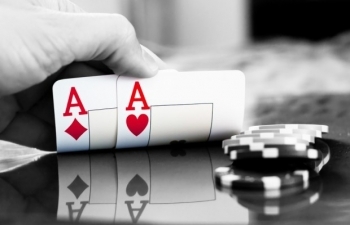 Want to get some free cash to play at some of the big and leading online poker rooms? Visit our poker promotions page and find out how you can get $20 free at PokerStars and get $88 free at 888 Poker no deposit needed. Just remember, that if you catch a bad beat; come on over and tell us about it.